The Investigator – a periodical published in London from 1932 to 1934. The Investigator was published by the Anglo-Ukrainian Committee which had been established in the UK to promote the hetmanite movement led by Hetman Pavlo Skoropadskyi. In the periodical it was stated that its publishers were “a small group of Englishmen” which was “the sole organisation in England working in conjunction with, and with the authority of, the Hetman of the Ukraine, Paul Skoropadsky”. The editor was Louis Tufnell, secretary of the Committee, though the real director of the publication was almost certainly Vladimir Korostovetz, Skoropadskyi’s London representative. The office of the publication was at St Stephen’s House, London SW1 (on part of the site of the present parliamentary building Portcullis House). The Investigator was aimed primarily at members of the UK parliament and others interested in matters concerning Eastern Europe. The publication promoted the idea of a struggle against communism in the Soviet Union to prevent it spreading to other parts of the world. The key to this task was seen as the establishment of an independent Ukrainian state under the leadership of Hetman Skoropadskyi. The Soviet press reacted to the publication of The Investigator by accusing the UK of allowing anti‑Soviet activities to take place on its territory. Publication of the periodical ceased shortly after the British Security Service came to the view that Skoropadskyi should be advised to close it down. 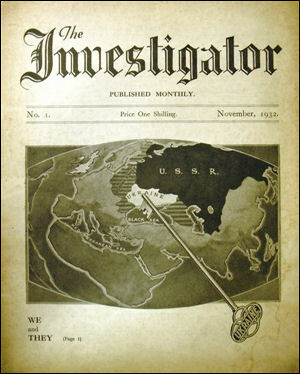 Eleven issues of The Investigator were published, initially at monthly intervals from November 1932 to May 1933 and thereafter less frequently until February 1934. A complete set of issues of The Investigator is held in the British Library, and an incomplete set in the Shevchenko Library and Archive in London.